Organizers and accountants can publish ledgers, journals, bullet journals, diaries, daily planners, calendars, etc. A chef or cook might publish recipes, daily diet plans, or a weight loss program. One thing you will need to publish your book is an ISBN. This is the number displayed in the barcode on the back cover of a book. CreateSpace offers FREE ISBNs and you may want to take advanatage of this if you plan to upload numerous books. Purchasing ISBNs can be quite expensive. The downfall is that it is fairly obvious that your book is self-published. This perception is not as bad as it was years ago. Today, many people are self-publishing high quality products and this is helping the industry. Just be aware that some bookstores will not choose to stock books with CreateSpace listed as the publisher. No Monetary Start-up Costs: It’s free to open an account. Discounts: Amazon often discounts CS books and you still get your full royalty. Returns: Amazon handles all returns. Your royalty is not impacted. Layout: Inside margins should be extra generous. Title on Spine: Must have over 100 pages to print a title on the spine and 131 pages is recommended for best results. Subtitles: Up to 255 characters are allowed in a subtitle. Blank Pages: You cannot have more than 2 consecutive blank pages in front or within the book (10 are allowed at the back). Page numbers alone are not enough to be considered a non-blank page. Some people have had such books approved, but it is no longer within the policy requirements. Page Quality: CS uses strong white pages. They work well for workbooks (as opposed to the cheap pages found in mass printed school books). Look Inside: Appears automatically within 2 weeks of your publication going live. If you do NOT want Look Inside available, you need to call or email CreateSpace support and ask them to turn off this feature. Liking Titles: Call CreateSpace for help linking variations (such as hard cover, paperback, audio, out of print (OOP) old editions, and Kindle) so they appear as a “Format and Editions” link on your listing page. Bulk or Volume Discounts: Contact CS to inquire about current discount rates. In the past, there have been offers for orders of 1,000 – 1,499 you got a 20% discount, 1,500 – 1,999 a 30% discount, and 2,000 and above a 35% discount. Always compare pricing with some short-run companies. There is also a book calculator here. Keyword Count: Five (5) keywords or keyword phrases are allowed and are separated by a comma. Each can be no longer than 25 characters. Don’t include a space after your comma. Search Results: Support says that Amazon ranking position in search results depends most on your keywords entered, followed by title and subtitle, but many other things can also impact rankings, such as customized customer results. Keyword Use: If a word is in your title, it’s not necessary to include it again as a keyword. Consider using a phrase instead. You don’ nee to use the word book as a keyword, but might use it as part of a keyword phrase. Research Your Self-Published Competitors: Enter your keyword and CreateSpace Independent Publishing Platform in a search at Amazon and see how successful the topic is and what books appear in the search results. Gather tips and keyword ideas from what other successful authors are doing. Title + Subtitle + Series + Volume: Consider using keywords in here. Learn more – click here. Fine Tune Your Ranking: Use Amazon Advanced Search to see how your book ranks and also, compare with other books. Click Here for Amazon Advanced Search. 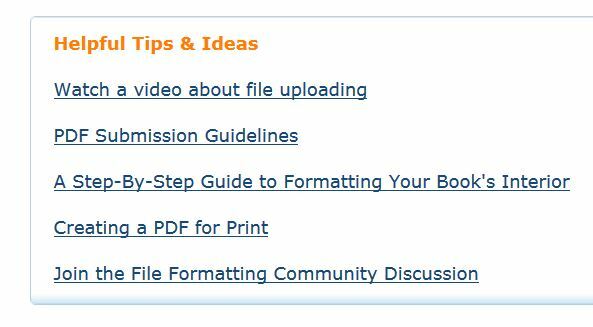 PDF Submission Guidelines – Login to CreateSpace and then click here or look for the help links when setting up your title. They are found under Set Up > Interior … look at the bottom of your Interior setting page on Amazon and you will see these links shown in the image below. Bleed simply means you have elements extending all the way to the edges of a page. If you are submitting your book with any images or elements that bleed, you will add .125″ to the width and .25″ to the height. EXAMPLE: For the trim size of 6″ x 9″ plus bleed, you will size your file at 6.125″ x 9.25″. Read full Article – Click Here. Amazon Cover Templates Files: Authors can submit JPG image files using the Online cover creator (choose full cover if you designed both front and back) or PDF when you click designed my own. Photoshop: When saving as a PDF, untick layers (use save as a copy) so the file will be acceptable when uploading to Amazon CreateSpace. Createspace E-Store and it’s Coupon Program: Createspace Estore and all it’s discount, coupon, and direct buying features that included higher royalties – closed on October 31, 2017. Influencers: As with any online selling, if you can get an Influencer to mention your product, it should help with sales. Don’t use your Amazon Prime Account to dropship orders. Anytime you are working with others, be sure to have a written document which includes the title of the work done, a statement that they are the original creator of the work, and a permission statement indicating the work is released to your company for unrestricted commercial use with additions and alterations permitted. Sometimes you will have to state to Amazon that you retain publishing rights to certain material, and provide any documents from other copyright owners which confirm your worldwide publication rights. “Transparency is editable type over anything, drop shadows, vignettes, objects over objects . . . Something has to decide how that’s going to look in one layer and then how all the little dots of ink (5.76 million/square inch) get put there.I noticed color shifts when I flattened art in Photoshop from day one, but I’ve never read a Photoshop book in which the author mentions that. It’s because of transparency. These shifts are usually so subtle that several Photoshop experts I talked with had never seen them. But it is those shifts that CS is warning about, and they could be noticeable. In places where the transparency is complex (complex regions) some of it will be rasterized or treated in a strange way (look for the T of many colors in https://www.createspace.com/en/community/message/158483#158483: that should be a pure black “t”). Sometimes there are stitching lines formed between atomic regions (areas of a page that have been treated separately)–some don’t print, some do print!” All in all . . . if you can submit flattened art, you’re less likely to have problems.”See SourceSee also: Flatten an image in Photoshop – click here.Merging layers combines several selected layers into one layer. Flattening occurs when you reduce all Photoshop layers to one background layer. For InDesign – learn more here.https://www.youtube.com/watch?v=9ryH0mW15PYInterested in Transparency Presets .. read a detailed article here.Why you should always get a physical proof: Read this. Repeating Text Box on pages. Use for things like your website or brand that you might wish to include on each page.